Deferred Prosecution Agreements (“DPAs”) and Non-Prosecution Agreements (“NPAs”) are a relatively recent but significant tool U.S. regulators are increasingly relying on to resolve allegations of corporate misconduct. In short, DPAs and NPAs are agreements by the government to forego enforcement action in exchange for the company’s agreement not to commit further violations of the law and to perform specific compliance and cooperation obligations. In 2011, U.S. regulators have already secured nearly $2 billion in fines and other penalties and are on pace to equal or exceed the number of investigations resolved using these agreements in prior years. 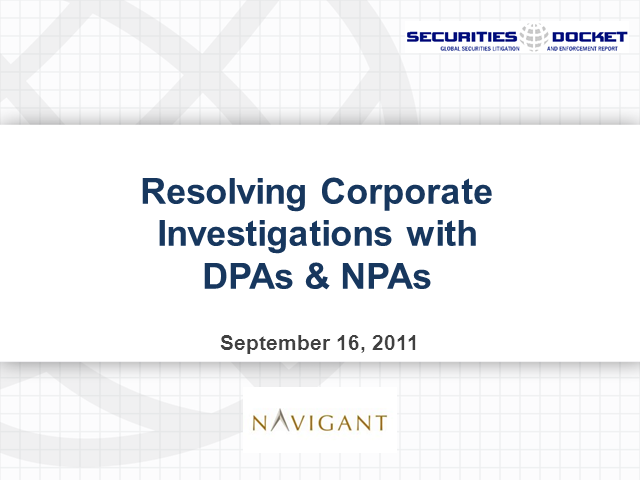 In addition to the DOJ’s Fraud Section, which uses DPAs and NPAs as its primary means of resolving corporate FCPA investigations, various other entities including the SEC, DOJ’s Antitrust Division, and numerous U.S. Attorneys’ Offices are increasingly using DPAs and NPAs to settle corporate investigations. But all settlements are not created equal. Accordingly, companies must actively manage the process to secure the best outcome possible under the facts and circumstances unique to each case. A company’s action (or lack thereof) can often determine whether it receives a DPA or NPA, whether the government requires a corporate monitor, and the amount of fines and penalties that must be paid. In this webcast, practitioners with decades of experience with DPAs/NPAs, corporate monitorships, internal investigations, and compliance programs will discuss the life cycle of an agreement, from start to finish.